Once you have completed your knitting, you will need to finish off the work. This known as casting off. 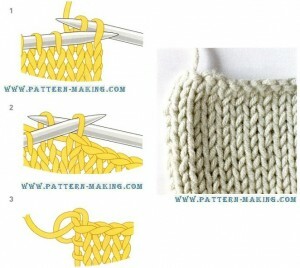 The stitches can be cast off as they are knitted, purled or worked in a pattern stitch, but the method is the Same. 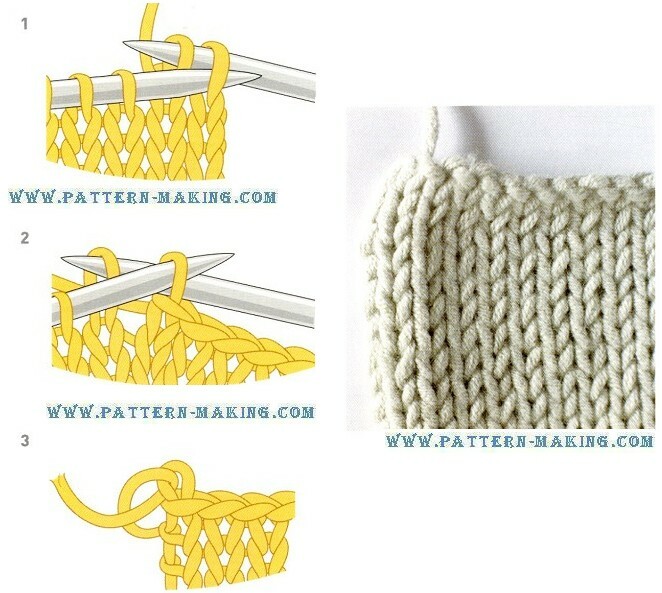 The simple knit cast-off is shown below. The finished cast-off edge. How cast off: Be careful when casting off not to do so too tightly. You can used size large,’ needle to avoid this, if you wish 1 Knit the first two stitches. Then pick up the first stitch with the tip of the left needle and pass it over the second stitch and off the right needle all together, to leave one stitch on the right handle. 2 Now knit the next stitch so there are two stitches again on the right needle. Cast off another stitch by repeating step 1. 3 Continue to cast off stitch by stitch across the row until only one stitch remains. Break the yarn, draw the end through the last stitch, and slip the stitch off the needle. Pull the yarn to fasten off. The tail end will be damed in later during making up. Finishing touchesThere are a number of useful tips and techniques that will help ensure a professional finish on your garment. Blocking: When you have finished the various parts of the garment. they should be pressed. Check the ball band for any pressing instructions, Pill out each piece of knitted fabric. wrong side uppermost, on an ironing sheet and check the measurements against the pattern instructions. Then block out each piece by pinning around the edges. to the size required. Lightly press in place, with a clean. damp cloth between the iron and the knitting. Avoid pressing the ribbing as this lessens its elasticity. Seams : The majority of garments are made up with a backstitch seam. which gives a tailored finish. For baby garment and delicate fabric. use a flat seam. For ribbing. use invisible seams. Backstitch seam: Place the two pieces of fabric right sides together. and pin in position, Sew together tilth a row at backstitches. worked one stitch in from the edge. as shown. Flat seam: Place the two pieces of fabric right sides together’. and pin in position. Sew together with loose over sewing stitches, matching ridge to ridge. Invisible seam: With the right sides of the knitting facing you. place the two pieces of fabric side by side. Stitch together as shown, working one stitch from each edge in tum. as shown.